Springs Creative uses EFI’s Fiery® DesignPro to improve creativity and productivity as well as reduce costs. Rock Hill, S.C.-based Springs Creative had one license for a design program that was not integrated with the Adobe® suite. 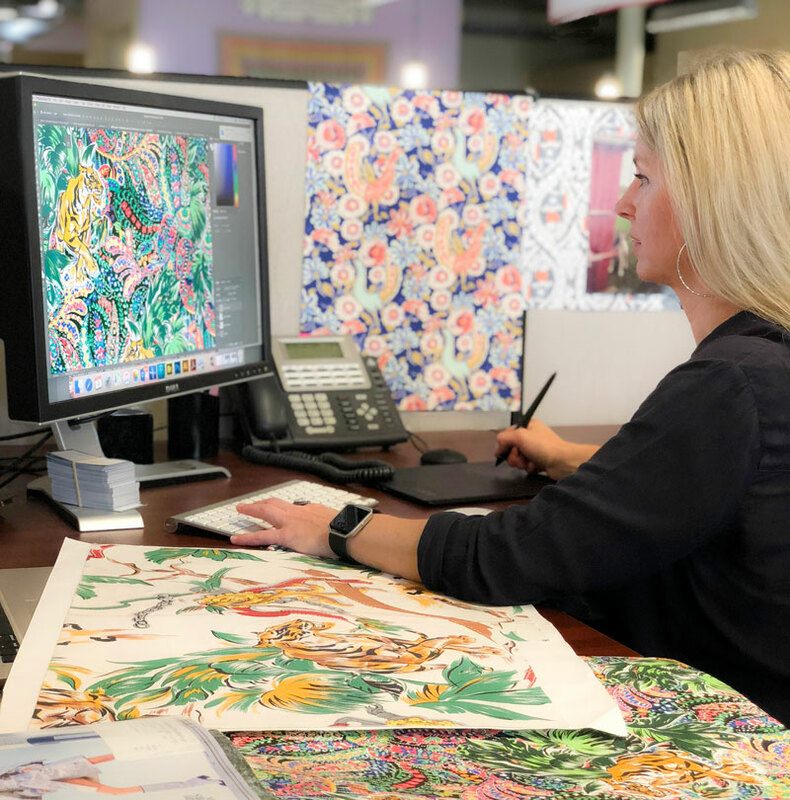 The company was looking to expand the number of textile design software licenses in an affordable manner to augment its Adobe Photoshop® and Illustrator® work. 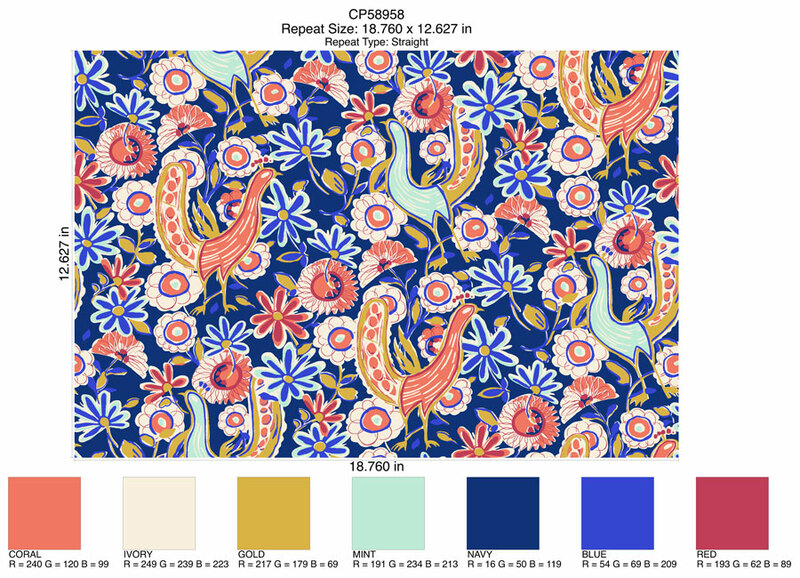 The goal was to enable designers to stay within the native Adobe suite and not have to go out to a separate program for textile-specific activities as well as to maintain access to tools, such as brushes in Photoshop, throughout the design process. The company has had several licenses for EFI™ Fiery® DesignPro since 2014 and has found many ways to enable more creativity, improve productivity, and reduce costs. In 1970, Springs Industries — formerly the 120-year-old Springs Mills and now Springs Global — bought the Finished Goods Division of Indian Head Mills of Massachusetts. From that acquisition, a new division, Springs Creative, was established — the Retail and Specialty Fabrics Division — to oversee the production of high-quality apparel and finished fabrics. 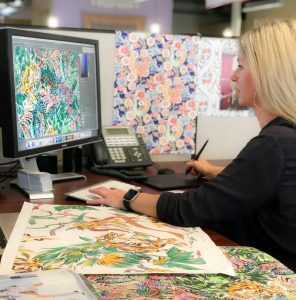 Located in Rock Hill, South Carolina, Springs Creative is a leading supplier of fabric for the do-it-yourself market, offering a wide assortment of printed and solid cottons, cotton blends, and high-tech fabrications in man-made fibers, as well as digitally printed custom fabric. Springs Creative has 120 employees. Beck notes that with Fiery DesignPro, she has been able to save hours on complex patterns with half drops. “It’s so easy now,” she says. “I can do a half drop or quarter drop, by row or by column. With a complex pattern, it used to take me as much as an hour. Now it’s five to 10 minutes. Depending on my workload, I was able to do three to four designs per day before. Now I can do nine to 12 — three times as many and without the headaches!” Another benefit for Beck is the ability to keep Illustrator designs in vector form for faster, easier scaling without risking rough edges. Beck uses Fiery DesignPro to create or update seasonal palettes as well. “We can have as many as five to 10 palettes each season,” she noted. 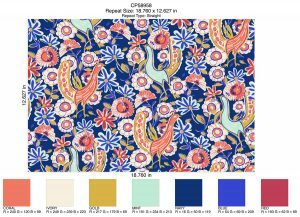 “Now not only can we create them faster, giving us more flexibility in our collections, but it is also extremely easy to share them with the team.” She also loves the ability to print out color chips. “They are a great color communication tool,” she said. “I can choose my colors and then automatically create a set of chips using the Colorist module, which gives me a choice of a range of similar colors and tones. That lets us choose the exact right color during the development process. Then the final color chip set is sent to our factories for them to match, both physically and digitally. This process was completely manual before. We had to create each square individually. It took hours. Now it is automatic, with results delivered in minutes.” In addition, Beck creates trend palettes that she can easily share with her team.